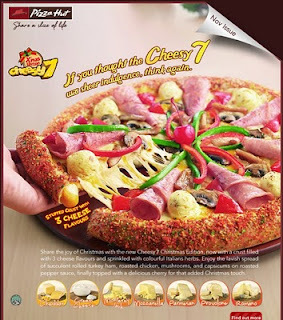 Every Christmas and Chinese New Year, Pizza Hut always out does itself by coming up with the weirdest looking pizzas in celebration of the season's festivities. I awoke at 5am this morning and found myself in an awkward position-it was too early for breakfast and too late to go back to sleep. Since Hubby was awake and game for a car ride, we decided to drive to Changi Airport to grab a bite. Terminal 2 boasts the greatest food selections, with a 24 hr Swensens, Ya Kun, Mac Donalds, Polar, Coffee Bean and Burger King. Since Hubby was in the mood for something heavy and hearty, Swensens was the obvious choice. Didn't take a picture of Hubby's food (chicken baked rice) as it looked quite boring. I did however manage to snap a most interesting looking cake as we were walking back. How very quaint and innovative! I used to think that all the yummy cakes that could ever be thought of had already been created. How wrong I have been! Update: A colleague gave me the KitKat mini log for Christmas this year. It looked delicious and Hubby immediately staked a claim over it. Unfortunately, it was all looks and no substance. The outer fudge layer crumbled off to reveal a pathetic looking sponge which was half hollow. What a bummer. Its been a great weekend. For the first time in a long while, I felt well enough to venture out on my own on a balmy Saturday morning. Raffles City immediately came to mind. Christmas is definitely in the air and I'm not complaining. I love the husky voice of Nat King Cole and Frank Sinatra serenading me as I peruse wines and candy in the Market Place. Santa claus shaped chocolates, peppermint snowballs and candy canes never fail to stir the Christmas mood in me. Though many segments of the basement are still under renovation and resemble a maze of sorts, it felt nice to get lost and discover little pockets of activity. Certain old favorites are still there, like the giant Cocoa Tree outlet (where I purchased a 5kg tub of Nutella for my sister in law's birthday), Toast Box, J Co Donuts, Din Tai Fung and Mos Burger. As I ventured further, I chanced upon Royce chocolate boutique and happily scooped up a miniature box of my favorite nama milk chocolate. Service unfortunately fell short and the lady who took my order looked disinterested and unhelpful. Undaunted and feeling slightly peckish, I walked on and stumbled upon a most pleasing sight- sizzling Takopachi balls from Gindaco. Gindaco's takopachi ain't exactly cheap at SGD6.80 for 8 balls (I topped up a further SGD1.20 for ice lemon tea) but taste absolutely delish when eaten piping hot. Soldering on, I stepped into a noticeably downsized MPH. Selected cookbooks were going at 20% off and I wanted to purchase a copy of "The Silver Spoon", a highly popular and well loved Italian cookbook which has been selling like hot cakes ever since the English version was released. Unsurprisingly, it was not available. After emerging from the bookstore, I took the escalator down towards Esplanade MRT and found myself surrounded by yet another line of new shops. Most of these comprised of nail boutiques and cosmetic shops. Boring. Just as I was about to turn around, my eagles eyes caught sight of a spanking new Dunkin Donuts outlet. The range of donuts was so tempting that my initial resolve to order 3 donuts quickly dissipated. Within 5 mins, happy me straddled out of the outlet with a box of 6 donuts (buy 5 get 1 free), SGD7 poorer. The lunch crowd was starting to swarm in by now and I was starting to feel slightly tired. Needing a quick pick me up, I went up the escalator and headed back to Raffles City again where I ordered a cup of ice milk tea from Gong Cha. Despite its Chinese origins, the shop is staffed largely by a bunch of heavily made up Malay ladies, with slightly bossy attitudes. You can opt for varying levels of sweetness. I chose "50%" but found it a little bland for my liking. Will go for 80% next time. Pity pearls were out of stock at that time - perhaps it was still too early. Buying Hubby's lunch was next on the list. Feeling too lazy to think, I popped by Toastbox and bought him a tub of mee siam. Toast Box's mee siam is thick and nutty- just the way Hubby likes it. To supplement his meal, I also ordered a piece of Mos chicken from Mos Burger next door. No trip to Raffles City would be complete without a quick swing by Marks and Spencers on the second level. Christmas spirit was definitely in the air. The food section was stocked with pretty Christmas themed biscuit tins containing the yummiest shortbread and chocolate cookies. Christmas promotions were also abound. As my hands were pretty full by then, all I could do was soak in the atmosphere. Raffles City is definitely one of my favorite places in Singapore. After the facelift, it seems bigger and better than ever. If only Singapore had more shopping centres like these.